Members of The United Methodist Church joined with Unitarian Universalists, Quakers, Catholics, Baptist, Jews and other faith groups and immigration activists early today to pray and prepare for a “Day of Prophetic Action” at the United Methodist Building on Capitol Hill. The group will rally and protest in front of the White House starting at noon ET in an act of civil disobedience to oppose what they say is the Obama Administration’s daily deportation of 1,100 migrants, including many unaccompanied minors. 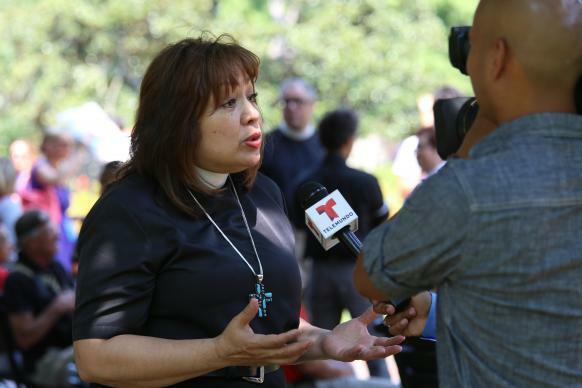 United Methodist Bishops Minerva Carcaño, California-Pacific Annual (regional) Conference and Julius Trimble, Iowa Annual (regional) Conference, will be leading United Methodists traveling from across the country to participate. Carcaño and Trimble participated in a similar protest on President’s Day, Feb. 18. "We have grown tired of living under these broken immigration laws our Congress refuses to fix," Carcaño said. "Our families are suffering, our congregations are suffering, our communities are suffering, our nation is suffering." Bill Mefford, director of civil and human rights for the United Methodist Board of Church and Society, said, "We will engage in peaceful civil disobedience until we are arrested. This action will show that we have done all that we can with Congress. It is time for no more excuses!" Watch live streaming of the event. A group of 12 people from Iowa are participating in the protest. Nataly Espinoza said that the Iowa group is looking to "do the right thing for our community. We're wishing and hoping to do the right thing for the kids who are at the border." She described a prayer service, recently held at Trinity Las Americas United Methodist Church to support those going to Washington. "It reminded everybody about how Iowans are welcoming to everybody," she said, as well as sharing that example to groups in other states. The Rev. Brian Carter, also part of the Iowa group, stated that six Iowans plan to be arrested. They have been briefed about what is entailed by being detained and will have some additional orientation prior to heading to the White House. "It's important to say," Carter noted, "this will be a non-violent witness calling for immigration reform and care for the children at the border."